At the front of Sorensen Park are the usual park amenities; softball fields, a tot lot and a picnic area. In the back is one of the best examples of a warm-water river eco-system in Michigan and a rare fen. Separating the two is the Holly Nature Center. All this is literally on the edge of Holly, a small town in the northwest corner of Oakland County. An amazing place if you know about it. But most people driving past the park entrance on East Holly Road don’t have a clue of what lies beyond the ball fields, including the Hiker T. Moose 5K Trail. After establishing the park, the small nature center was added in the late 1990s and a trail system was developed. 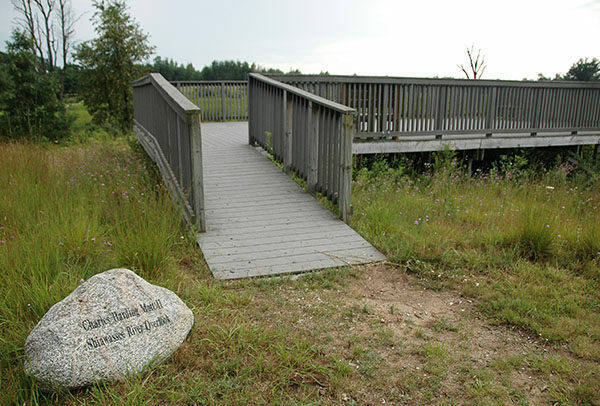 The crowning jewel of the park, however, arrived in 2003 when park officials use a grant to build the Charles Harding Mott II Shiawassee River Overlook. The massive observation deck now anchors the south end of the park’s trail system and allows hikers to view the amazing fen that surrounds the Shiawassee River. From start to finish, the Shiawassee River is a watershed that covers 742,400 acres and supports more than 40 species of fish, including darters, minnows, and channel catfish. The river also plays an integral role in the travels of migratory waterfowl while the swamps and fens adjacent to the river's headwaters support several globally rare species, including the massasauga rattlesnake, Blanding's turtle, and insects such as the powesheik skipperling. The wetlands, fen and the headwaters of the Shiawassee are prominent features of the Sorensen trail system. The Hiker T. Moose is a 5-kilometer trail covers the entire trail system but includes 2 kilometers that wraps around the softball fields and picnic areas at the developed north end of the park and walking what is referred to as the Shiawassee Loop twice. It’s the only way to get a 5-kilometer route in a 93-acre park. For those more interested in the vast wetlands and fen than piling up mileage, a more interesting hike is to combine the Wetland Edge Trail with Shiawassee Loop and Little Bluestem Trail for a walk of 1.6 miles. 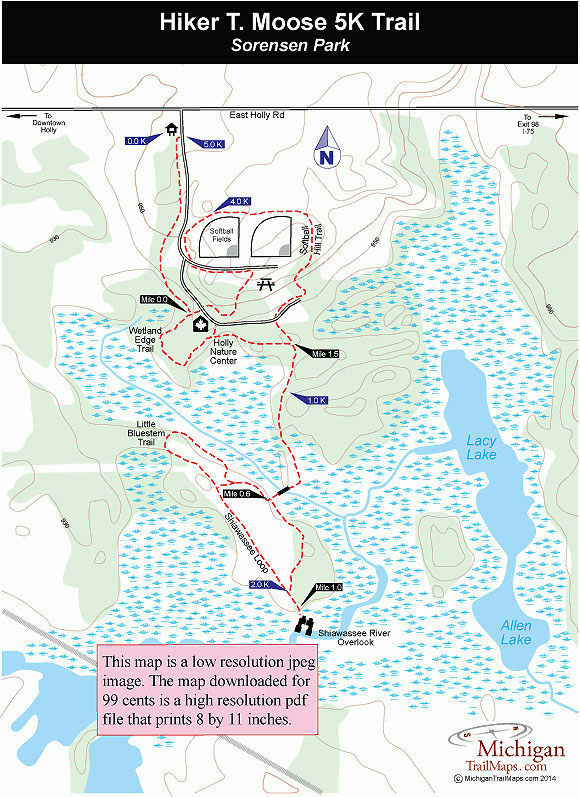 The Hiker T. Moose 5K Trail is posted on the west side of the park road just after you enter from east Holly Road. It stays in the thin strip of woods along the park border, skirts the maintenance barn and merges into the Wetland Edge Trail within at Mile 0.3. To skip this portion, park at the Holly Nature Center where the Wetlands Edge Trail is posted on the north side of the building. The Wetland Edge Trail is a 0.25-mile loop that indeed skirts a small wooded wetland in the beginning and then a spur to a Swamp Overlook. Just before returning to the nature center you pass a junction that is posted as “Shiawassee Overlook Trail” with the foot path heading east (right). Follow that and within 200 yards you’ll pass another junction where the Hiker T. Moose Trail splits off to head north as the segment known as Softball Hill Trail. The Shiawassee Overlook Trail swings south here and soon becomes a dry route between two vast wetlands, impressive scenery if the bugs aren’t overwhelming you in June or July. 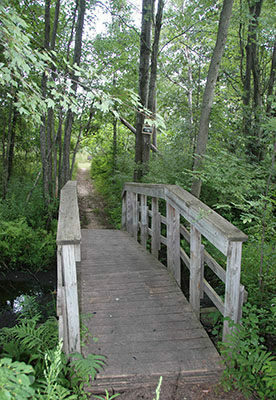 Within 0.6 miles the trail swings west, uses a foot bridge to cross a stream and comes to a posted junction with the Shiawassee Loop. If you head north (right) you soon come to the posted junction with the Little Bluestem Trail and then pass a sign for 1.5 kilometers before swinging south to hike the backside of the loop. Before returning to the Shiawassee Loop you hike underneath a power line for the third time, amazingly it’s the only man-made intrusion seen after leaving the nature center. Within a mile of the center you arrive at the short spur to the Charles Harding Mott II Shiawassee River Overlook. It’s a long name for an observation deck but this one seems worth it. 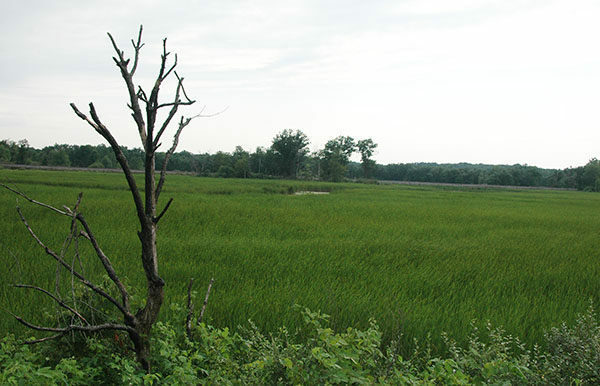 The deck allows you gaze over an extensive sea of cattails and wetlands that makes up the headwaters fen. In the middle of it, like winding ribbon, is the Shiawassee River while all around you is nature, pure and simple. You’re on the edge of Holly, yet you feel like you’re in the middle of nowhere. Within a few minutes after leaving the overlook you’re back at the Shiawassee Loop junction with the foot bridge just to the east. A sign reminds those who want to cover 5 kilometers that they need to follow the loop a second time. The rest of us can backtrack the earlier segment At Mile 1.5 you return to the junction with Softball Hill Trail, where the Hiker T. Moose Trail heads north to climb the the ridge and then skirt the two fields. It finishes up by swinging through the picnic area and then backtracking first half kilometer segment to the trailhead. If you’re parked at the nature center head west (left) instead and within minutes you’ll be at your car amazed at the terrain you just hiked through. Sorensen Park features softball fields, a play area and a picnic area with tables and grills but no source of drinking water. 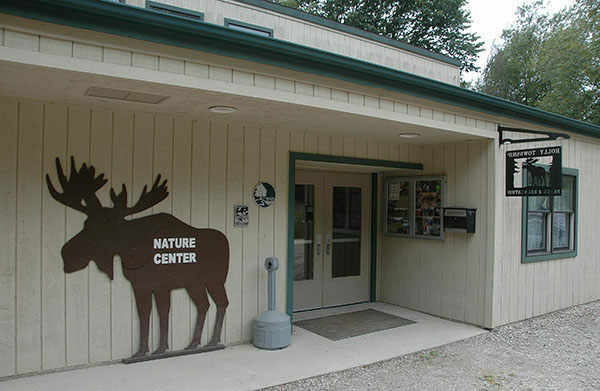 The Holly Nature Center is a small facility with two rooms of displays and hands-on exhibits. If you’re arrive with children it makes for a brief introduction to the wetlands your young hikers will be passing through. The Holly Nature Center is open Tuesday and Thursday from 9 a.m. to 5 p.m. or when a park staff member is in. There are no entry or vehicle fees to use the park. From I-75, depart at exit 98 and head west on Holly Road. Eventually Holly Road swings north and then west again where Rood Road splits to the north. You arrive at the Sorensen Park entrance, one the south side of Holly Road, 1.4 miles from Rood Road or 3.7 miles from I-75. It’s easy to miss the park entrance. Contact Holly Township Parks and Recreation at (248) 634-1758 or online at www.hollyparks.org.